59: "Millennium Enemy 10: The Last Die Roll"
Section 3: Monster World arc (第（だい）三章（しょう） モンスター・ワールド編（へん） Daisanshō Monsutā Wārudo-hen) is a story arc in the Yu-Gi-Oh! manga. Dark Bakura traps Yugi and his friends in his RPG board game Monster World. With Yugi, Anzu, Jonouchi and Honda as pieces, Dark Yugi uses them to face Dark Bakura. Yugi, Jonouchi and Honda end up facing the guidance counselor Tsuruoka in a game where they must find a hidden keychain or risk expulsion. Katsuya Jonouchi takes part in a TV game show, called The Get the Million Game in order to pay off his father's gambling debts. Yugi Mutou takes-up playing the game Monster Fighter, which quickly becomes popular at school. Yugi is soon challenged to a game by Koji Nagumo, who has a reputation for stealing. Dark Yugi and Koji "the Spider" Nagumo continue their Shadow Game of Monster Fighter. After trying to cheat cost him the previous game, Nagumo begrudgingly agrees to play fair. Anzu and Yugi go on a date to Domino Park. In Anzu's attempts to make the other Yugi appear, she ends up used in one of the Playing Card Bomber's dangerous games. Yugi's classmate Imori arrives at the Kame Game, asking about an ancient game, he has found. Sugoroku Mutou recognizes it as the ancient game, Dragon Cards, and warns Imori not to open it as yin and yang would clash, creating a warped power. Dark Yugi faces Imori in another game of Dragon Cards. Dark Yugi plays to win back Yugi's soul, while Imori plays to take the Millennium Puzzle and become the Guardian of Darkness. Jonouchi hears of a gang using a yo-yos to mug people and vows to teach them a lesson. Jonouchi and Dark Yugi battle Hirutani and his yo-yo-wielding gang. Yugi and his friends meet Ryo Bakura, a gentle new student with an interest in role-playing games. Little do they know of the danger that dwells within him. 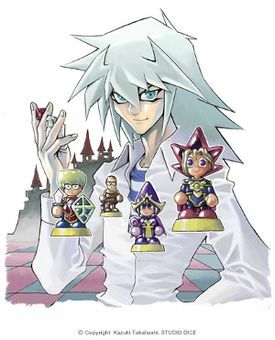 Dark Bakura posing as Ryo Bakura starts playing Monster World with Yugi, Jonouchi, Anzu and Honda. "Millennium Enemy 3: Monster World"
Yugi and his friends continue to play Monster World with Dark Bakura. In the game, they encounter a stranger, who has been attacked and decided to help him. Dark Bakura continues to seal more of his opponents' souls in miniatures, as they play Monster World. Sen'nen no Teki Go -Renzoku Kuritikaru wo Soshiseyo! Dark Yugi rolls for his friends, who are trapped in Monster World figures, as they battle the monsters formed from Dark Master Zorc's hand. Suspecting foul play, Dark Yugi decides that he must stop Dark Bakura's "Run of Criticals". Yugi, Jonouchi, Anzu and Honda enter Zorc Castle, where they get caught in a trap and rely on Dark Yugi to rescue them. The adventurers battle Zorc at Zorc Castle. Despite the double hit being outlawed, Dark Yugi and Dark Bakura have ways of influencing their dice rolls. "Millennium Enemy 8: Battle! Battle!!" As the adventurers continue to battle Zorc, they are aided by Ryo Bakura, who hinders Dark Bakura's play. The adventurers, joined by the white wizard Bakura battle Zorc, who changes into his final form, Last Zorc. "Millennium Enemy 10: The Miraculous Dice Roll"
Dark Yugi and his friends finish their game of Monster World with Dark Bakura. The result of the game rests in a final dice roll between both sides. This page was last edited on 23 September 2018, at 15:22.